Hillside, NJ—September 17, 2013 — Backing the recently launched Yu-Gi-Oh! Game Card Wallet Kickstarter isn’t the only way to score an officially licensed, custom designed game wallet as WizKids/NECA today announced a special giveaway, inviting fans and backers the chance to win one of three free custom wallets. Fans can enter now through October 2. 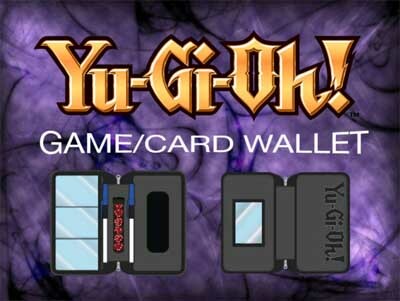 Presenting the first game card wallet of its kind, the WizKids/NECA Yu-Gi-Oh! Game Card Wallet has been designed by players, for players, and is offered exclusively through Kickstarter. Dependent on a successful Kickstarter project campaign, three limited-edition game card wallets will be delivered, free, to three lucky fans. The special giveaway runs today through October 2 and all that is required to enter is a valid email address. All entrants will receive a unique code that can be shared with friends—each friend who enters using that code will earn the initial entrant an additional entry. Winners will be randomly selected on or about October 3. For more details or to enter, visit yugiohgamewallet.com. Visit the Kickstarter project page here. WizKids/NECA, LLC, a wholly-owned subsidiary of NECA, is a New Jersey-based game developer and publisher dedicated to creating games driven by imagination. WizKids first pioneered the Combat Dial system featured in HeroClix, the most successful collectible miniatures game on the market today, with over 400 million miniature game figures sold worldwide. WizKids continues to produce new proprietary game platforms and properties including the award-winning board game Mage Knight, the groundbreaking Dice Building Game engine used in the critically-acclaimed game Quarriors, as well as the innovative Connect with Pieces puzzle building game platform. For additional information, visit www.wizkidsgames.com. The Yu-Gi-Oh! Card Wallet Kickstarter Campaign is Live!